Guest post by Dr. Richard Scriven. Richard is a Postdoctoral Fellow in the Department of Geography, UCC, researching pilgrimage in Ireland. My exhibition, Journeys of Belief and Belonging: Modern Irish Pilgrimage in the UCC Library, explores the pilgrimage tradition and how it is manifest in contemporary Ireland. It illustrates how pilgrimage is a vibrant cultural phenomenon that inspires millions of people annually to leave home, go on a journey, and try to connect with the more meaningful aspects of life. An evocative account of the activity is presented through quotations from research participants and images from some of Ireland’s main sites Lough Derg, Co Donegal; Croagh Patrick, Co. Mayo; Knock, Co. Mayo; and, a holy wells in Munster. I am also running public seminars on the topic to encourage public discussion and further conversations about the role of pilgrimage. The project is funded by the Irish Research Council and UCC Library. The exhibition is a form of ‘public engagement’. This is the idea that researchers need to communicate their work not only to others in their field – usually through peer-reviewed journal articles and conference presentations - but also to a broader range of audiences. My public engagement programme aims to inform and educate the public about the role of pilgrimage, while also highlighting the importance of socially and culturally relevant research. It uses several platforms to present fieldwork images and the experiences of pilgrims, with context and commentary added to prompt new considerations. The idea of public engagement is fundamental to both research and universities. As Moseley (2010, p.109) points out ‘although producing knowledge for its own sake is good, many commentators would argue that information should also be produced for the betterment of the human condition’. This speaks to the role of research more generally as a means of contributing to society. Comparably, universities, as public educational and knowledge-based institutions, have underlying purposes to communicate ideas and to add to civic discourses. Indeed, UCC’s motto of ‘Where Finbarr Taught, let Munster Learn’ captures this sentiment, referring to the people of the region as a whole. Within my field, this approach is sometimes called ‘public geographies’ which is ‘about bringing a disciplinary perspective into a broader conversation with the public’ (Moseley 2010, p.109). It highlights the importance of good research which studies relevant and significant issues, and then ensuring that the findings enter public discussions, and where applicable lead to policy and societal change. There is, however, a gap between these ideals and the realities of research and university life. Furco (2010, p.375) contends that ‘community-focused public engagement activities are not typically found at the forefront of the academy’s work’. The combined pressures of the research and university environment, which prioritise peer-reviewed publications and quantifiable impacts tend to down-grade the role of public engagement. Instead, institutions and funders need to ensure that civic engagement projects are recognised as valuable activities in funding and job applications. We need to strive toward more active approaches in which ‘community engagement is integrated into the research, teaching and service mission of higher education institutions’ (Furco 2010, p.387). It is only from such a position that findings and discussions will reach general audiences and flow towards societal change. Fortunately, my emphasis on public geographies was seen as being an important component of my work by the Irish Research Council and UCC. I included a strong public engagement programme as part of my funding application for my fellowship. UCC prioritises external engagement as one of its strategic goals. In addition, the UCC Library were extremely enthusiastic about my idea for an exhibition, which is being run as part of their regular exhibitions for the general public. This type of institutional support is essential to nurture an environment that prompts and furthers community engagement practices. Consideration has to be given to how researchers communicate with the public. It is not just a matter of agree on the value of civic engagement, it is also about the form and effectiveness of these programmes (Stilgoe, Lock & Wilsdon 2014). Academics are used to writing and talking in certain ways, drawing on concepts and acronyms which are unfamiliar to those outside their fields. The challenge is to learn to ‘to focus on presenting, or "framing," their messages in ways that connect with diverse audiences’ (Nisbet & Scheufele 2007, p.39). In effect, we must ‘translate’ our work, using everyday language to ensure to reaches a broad range of people. For example, the UCC Postgraduate Showcase is an annual event that encourages researcher students to ‘develop innovative ways to communicate their research to non-specialists, and to present a compelling story around their thesis topic’. As part of this process, we must be conscious of our target audiences and how best to effectively make an impact (Stilgoe, Lock & Wilsdon 2014). Public engagement will continue to become an important part of the research and university landscape. Institutionally, it requires support, while researchers need to meet this challenge to communicate to public as well as their peers. For me, the exhibition and public seminar are an integrated part of my postdoctoral fellowship. They are one of the main pillars on which I centre and assess my work. Hopefully, this will encourage others to reflect on how they can communicate their research to broader audiences to help improve society. Furco, A., 2010. The Engaged Campus: Toward a Comprehensive Approach to Public Engagement. British Journal of Educational Studies 58, 375–390. Moseley, W., 2010. Engaging the Public Imagination: geographers in the op-ed pages. Geographical Review 100, 109–121. Nisbet, M., Scheufele, D., 2007. The Future of Public Engagement, The Scientist 21, 38–44. Stilgoe, J., Lock, S.J., Wilsdon, J., 2014. Why should we promote public engagement with science? Public Understanding of Science 23, 4–15. In March 2017 I had the opportunity to spend an entire 4 weeks at the Boole Library of University College Cork. Everyone at the library was very welcoming and made sure I would gain as much insight into their work as possible. My schedule had emphases on three main areas, which were Archives, Special Collections and the Online Repository. Additionally, I got to spend a few hours in most of the other departments of the library, thus getting a pretty good picture of how the library functions as a whole, what the current challenges are and how the library is integrated into the library system and into academia nationally and internationally. I learned a lot about libraries and librarianship in Ireland in general, which was great because this made it possible for me to see similarities as well as differences to libraries in Germany. In the Archives and Special Collections departments of Boole, archivist Emma Horgan and Special Collections Librarian Elaine Harrington introduced me to their unique collections and made sure I became familiar with a variety of their materials. Working my way through quite a few old plans, maps and other outsizes from the Bantry collection, I discovered how the holdings of the Bantry estate changed during the first half of the twentieth century and learned of fishing restrictions that were marked in sea and river charts of West Cork. Depending on the state they were in, the maps had to be wrapped in mylar and/or acid-free paper to ensure their conservation. Due to their sizes, the flattening of some of the maps before they could be wrapped provided quite a challenge that could only be met with the help of lead snakes and weights. 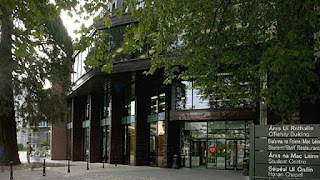 In addition to the landed estates that make up quite a few of the Archives’ collections, the library holds a number of collections by scientists, scholars and authors that are in any way connected to Boole Library, most notably George Boole himself, the inventor of Boolean Algebra. He is responsible for the Boolean operators that form one of the bases of every library catalogue or database search. A challenge every library faces today is the shortage of storage space. One of my tasks was to check the printed holdings of serials in the reference collection of the Special Collections reading room against their online availability. Whichever serial is available online would be a candidate to be moved to the closed stacks, thus gaining some space on the shelves in the reading room. Elaine also showed me how she introduces students to Special Collections. Depending on the focus of the class, she chooses fitting examples from the various collections. Using these examples as props, she familiarizes the students with the extra care in handling some of the material requires, and makes them see how they can make use of the many resources in Special Collections. The emphasis the library puts on the services it provides for the students is great. Talking to the liaison librarians I learned of their work in teaching classes on information literacy, always making sure to cater to the specific needs the students of particular subjects might have. In addition to that they are responsible for all sorts of online content that helps the students improve their research skills. I especially liked the libguides that make it easy for students to get started with their research. For each field, there is a libguide online that brings together the most important resources for that field, such as the major databases and online journals. I liked the role of the liaison librarians a lot. Liaising with the academic staff is important to any academic or research library and it seems to me many libraries ought to put a little more effort into it. It also makes sense to me to put a great emphasis on teaching information literacy in classes and individually, since it is one of the core skills an academic (or pretty much everyone) should have and the effort will definitely improve research output sustainably. Boole Library has taken it upon itself to promote (green) open access among their researchers and scholars. Breeda Herlihy introduced me to the department of Research & Digital Services and the workflows in getting open access content into their online repository CORA. I was able to learn hands-on how to handle metadata and how to feed it into the repository as well as getting more familiar with the Dublin Core standard and the handling of csv-files. I also had the opportunity to spend some time with the librarians working in acquisitions, in cataloguing and in collection development & management. The workflows there reminded me a lot of those I know from German libraries. The only major difference is that Germany integrated their acquisitions and cataloguing workflows a few years ago. The challenges libraries face with the high prices for journal subscriptions and consequently most of their budget going into serials seem to be the same everywhere. Processing purchased as well as donated books and keeping track of legal deposit copies also works rather similarly. It is interesting to see the close link to the UK – the Irish Copyright Act entitles the British Library as well as four other libraries in the UK to receive one copy of every book published in Ireland. A highlight was when Martin O’Connor and Ronan Madden let me sit in on their radio show Shush! – Sounds from UCC Library on UCC radio during my last week. Even though they didn’t make me talk into the microphone (which I was very thankful for! ), I was able to engage via Twitter, learning a little bit of social media use hands-on. A library radio show is definitely something more libraries should consider. Shush! is on every Monday from 11-12 and a podcast of the show is available afterwards. I want to thank everyone I met from the Boole UCC Library staff, especially Martin, Emma, Elaine and Breeda, for making my four weeks in Cork an insightful and rewarding experience. Once again I trawled the Web for some free Webinars that might be of interest to you too. The first of the four listed below considers the possible impact of artificial intelligence, shopping trends and live game streaming on library services. Number two discusses case studies in academic libraries that have highly impacted service provision and patron outreach. The third Webinar reports on innovation initiatives of public libraries driven by their constituent communities. The last online event is a mini-conference on Fake News within the context of digital literacy competencies. This webinar will be of interest to staff in all types of libraries interested in emerging technology trends and how they might affect libraries and/or their patrons. Guest post by Sarah-Anne Kennedy, Dublin Institute of Technology. 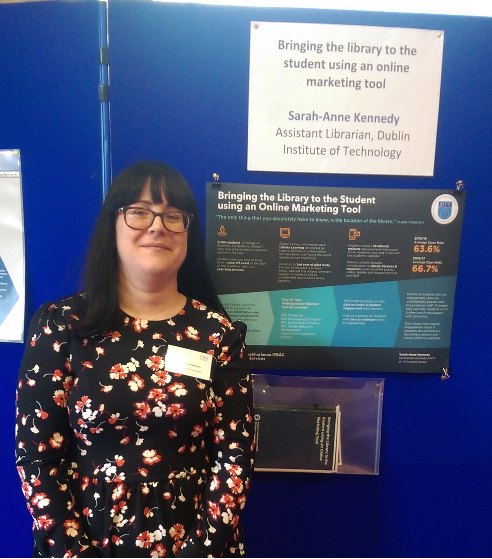 Sarah-Anne holds a BA (Hons) from the National University of Ireland Maynooth (MU) in English and History and a Masters of Library and Information Science from University College Dublin (UCD). She has been with the Dublin Institute of Technology (DIT) since 2006 and is currently supporting the College of Business, the School of Media and the School of Law. 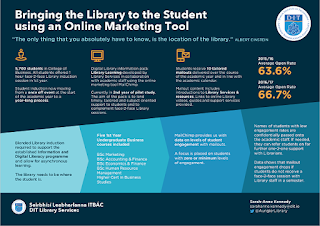 Sarah is interested in engaging and supporting students through blended learning and looking at new ways of bringing the Library to the student. The 6th annual Learning, Teaching and Student Experience (LTSE) conference took place in Bristol, the UK on the 25-26th April. The conference is organised by the Chartered Association of Business Schools who are also based and operate across the UK acting as the “voice of the UK’s business and management education sector”. This conference offered a great opportunity to learn how our academic peers in the UK are engaging with students. It also offered an opportunity for me to learn what the similarities and differences are between the Irish and UK higher education landscape. I had an opportunity to present a poster on ‘Bringing the Library to the Student using an Online Marketing Tool’. (see images attached) So, with my poster in hand, I travelled to Bristol for the day to attend day two of the conference. The opening session, by keynote speaker Phil Race, set the tone for the day and was one of the most interactive, engaging and funniest keynotes I have ever attended. Phil’s biography is distinguished and long but he introduced himself as an author, scientist and educational developer. Phil’s keynote focused on Making Learning Happen. He advised on not focusing on old or traditional methods of teaching but encouraging new ways to teach in the classroom or lecture hall. He advised us not to exclude mobile phones and laptops from the classroom. However, he reminded us that in the exam hall students are on their own, with no internet access (for the time being anyway) so we have to teach them to stand on their own and be confident in their learning. Phil does not support the idea of learning styles, however he agrees that one size of assessment does not fit all. So how do we tackle this? How do we get students to engage? Phil argued that teaching and learning don't really work on paper alone or online alone. Students also want to see evidence. “What does a good assignment look like? What does a bad assignment look like?” Students also learn by doing so learners need to have room to make mistakes. We need to create a constructive environment for them to do this. Feelings are important so students need praise to gain confidence. Feedback needs to be timely and they need to see what’s in it for them. If they can see the benefit they will invest. Learn from needing to learn. What are the remaining two factors? We ran out of time so you can visit Phil’s slides from the keynote to find out. Thus, Phil provided an opportunity for our own learning after the conference. The conference offered a large range of themes which can be viewed in more detail here. Over the two days 80 plus sessions were delivered, each of which reflected one of the 13 conference themes. As you can imagine from that long list, it was difficult to choose which breakout sessions or workshops I wanted to attend. In the end, I decided to focus on the following themes: Employability, Employer Engagement and the Practice based Curriculum and Student Engagement. Employability is well established in the UK and this was evident from the range of breakout sessions offered on this theme as well as the number of posters that included this topic in their content. The first breakout session (‘Supporting business schools to drive learning gain & employability’) outlined how in partnering with academic institutions, the Chartered Management Institute (CMI) are tackling the notion of a student becoming an accidental manager for example. Engaging with future employers allows the institutions to enrich the curriculum. Master classes are offered to students online from leaders of industry. Mentoring programmes allow students to build relationships with professionals. CMI offers free employability support to students upon graduation and they are aligning their partnership to the Teaching Excellence Framework (TEF). The second breakout session (‘User experience (UX) design and employer involvement that improves student engagement’) also looked at employability. The University of East London (UEL) have partnered with Pearson to develop an online platform called ‘Your Way’. This partnership allows UEL to offer a sophisticated online platform that provides students with an opportunity for self-directed learning. Competencies are developed with employers. Students choose their competencies based on their needs, which in turn allows for a personalised journey. It was evident from the sessions that partnering with employers had allowed the institutions to provide sophisticated and student-centred online spaces to support employability and teaching and learning. Employability, in its current UK state is new to Ireland. DIT Library Services recently collaborated with our Career Development Centre in developing Job Space. 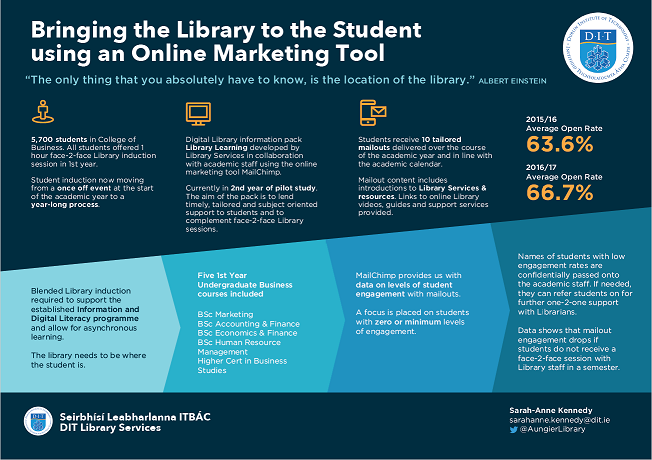 The Library’s contribution is showing students how they can transfer their existing IL skills to research companies and potential employers. In turn giving them the edge over other candidates who may not have these skills or resources. Is there scope for growth in this area in Ireland? I left the sessions wondering would partnering with industry leaders encourage our own students to engage with IL? Would master classes delivered by industry leaders and professionals allow students to see the importance of IL in their learning journey? The third breakout session (‘‘Student engagement: active learners through the co-creation of content’) looked at how the teacher can become the facilitator of student learning. Students are provided with the freedom to explore materials independently. While it was agreed that not all students like this degree of freedom or lack of defined structure, in the end students could see the value of the process. Their learning wasn’t just about the end result but the learning process. The benefits included job satisfaction for teachers, making students more responsible for their own learning and seeing students learning and not just attending. This type of learning environment was offered to postgraduate students with an average age of 30. I struggled to see how it could work with our undergraduate students or indeed international students where rote or directed learning is the norm in their home country. The fourth breakout session (‘How can we integrate students’ use of mobile phones and interactive technology within the lecture lesson plan in order to improve engagement?’) tackled the frustrating issue of the ‘distracted generation’. Phones are in the classroom so instead of asking for them to be put away we should harness mobile technology. Some of the technology mentioned was nothing new to me, Socrative, Office 365, Pole Everywhere, Twitter. However, it was interesting to learn how students were enthusiastic about the use of phones in the classroom. They did not see it as an encroachment on their personal space and it allowed for the opportunity to mix things up and provide an interactive learning environment. One takeaway that I felt was important was that by embracing technologies that are used in industry and using them in the classroom, students’ digital skills were developed and they could see the benefit in getting to grips with this technology in a safe environment. Never write anything without a publication aim in mind, be it slides, a presentation, a report etc. Hot topics are sometimes helpful in getting you published but is this the right way to approach it? Look at the trajectory on previous conversations on a topic. The top themes can lead but ultimately you should go for what interests you. Writing allows you to connect with your students -you can identify with their struggle to write their assignments. My ultimate takeaway from the day was how employability is well established in the UK. While it does have its detractors, e.g. are we simply creating workers instead of learners? Is education simply to provide a workforce? It was impossible not to see how partnering with industry had allowed academic institutions to enhance their own curricula and teaching and learning resources. Is there scope for partnering with industry to demonstrate to students the importance of engaging with IL? Overall, I was pleased to see that our some of our teaching and learning practices and experiences weren’t too different from what was happening in the UK. My other take-away was that, to the best of my knowledge, I was the only Librarian with a poster presentation or even in attendance on the day. What does this say about our role in teaching and learning and how we, as a profession, see ourselves in the higher education landscape? Hopefully the National Forum for the Enhancement of Teaching and Learning in Higher Education’s funded project L2L: Librarians Learning to Support Learners Learning will work towards addressing this issue and show us that, as Librarians, we have a place at the teaching and learning table.